Just Jingle: My Final Card as Sweet 'n Sassy Guest Designer! Wow! September has FLOWN by! Today I have posted my final card as the September guest designer over at Sweet 'n Sassy Stamps! 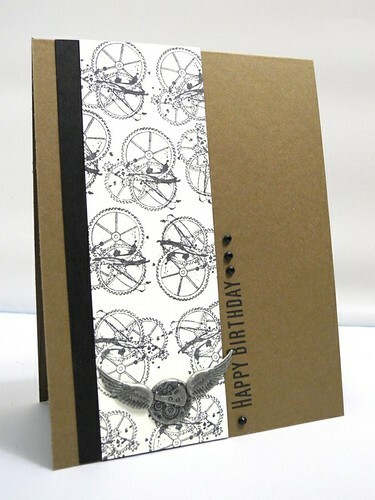 I decided to create a birthday card using the awesome gear stamp from the Timeless Classic stamp set. I love this set! I have used it several times and the results always make me happy! I combined the great gear image with some really cool brads from Eyelet Outlet. 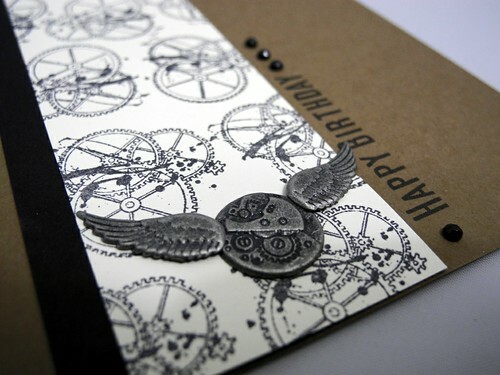 I used the clock parts brad and two of the wing brads to create the perfect embellishment for this card! I have really enjoyed my time as Guest Designer over at Sweet 'n Sassy Stamps! I hope you have enjoyed the cards I have shared for them, as well! You've had a terrific showing! Helps that YOU are sweet and sassy, I'm sure! Going into my favorites file, I love the simplicity of it and how masculine it is. Whatta fabulous card...super masculine one! So manly looking i love it.